The Military Order of the Dragoon to U.S. Commander Gibbons; Blackened bronze with gilt, (J.H. GIBBONS. COMMANDER. UNITED STATES NAVY. No 1240.). Naming is engraved on the reverse. Swivel suspension, period substitute ribbon with brooch pinback, maker marked "WHITEHEAD & HOAG CO PAT. APPL'D. FOR" on the pinback, scuffing on the reverse, near extremely fine. Accompanied by fifteen pages with copies of his Officers Service Records, a Service Record List from the United States Navy, three Reproduction Photographs (101 mm x 151 mm each), along with assorted research papers Footnote: John Henry Gibbons was born on January 7, 1859 in Grand Rapids, Michigan. He was to have a long and distinguished career with the United States Navy but its wasn't to be without controversy. He was appointed Cadet Midshipman, Fifth District of Michigan on September 18, 1875 and was one of the oldest graduates of the Naval Academy, graduating in 1879. He was detached from the Academy and was waiting for orders on June 10, 1879, then assigned to the U.S.S. Adams, a single screw, wooden-hull, bark-rigged steamer, on August 12th. He returned to the Academy on May 2, 1881 and was promoted to Midshipman on June 10th, ordered detached from the Academy and waiting for orders on June 15th, before being assigned to the U.S.S. New Hampshire on August 19th. He was then assigned to the U.S.S. Jamestown on January 5, 1882, promoted to Ensign (Junior Grade) on March 3, 1883 and promoted to Ensign on June 26, 1884. He was ordered detached and waiting for orders on March 2, 1885, assigned to the Naval Observatory on May 18th, then to the Naval Academy on September 1st. Ensign Gibbons was assigned to the U.S.S. Constellation on May 20, 1886, the returned to the Academy on September 1st. Two years later, he was ordered detached and waiting for orders on September 1, 1888 and assigned six days afterwards to the U.S.S. Mohican on September 7th. Gibbons was transferred to the U.S.S. Vandalia on January 14, 1889 and would face a near death experience two months later. He almost lost his life in a massive hurricane in Apia, Samoa on March 16th, on which Gibbons was serving aboard the Vandalia as a junior officer. It was "the severest disaster which has befallen the Navy in recent years" to quote the annual report of the Secretary of the Navy for that period. During the hurricane, Gibbons and some of his shipmates went up the mast and formed a human wind-sail, in an effort to prevent the vessel from being driven ashore. The elements were too much for them, with the U.S.S. Vandalia and another ship, the U.S.S. Trenton being wrecked. They were described as "two of the best of the old wooden fleet". Native Samoans assisted the Naval Personnel ashore, with much of the armament and equipment of the two vessels being saved. In addition, the U.S.S. Nipsic was run ashore, to save her from destruction. Rear Admiral Lewis A. Kimberly, U.S. Navy, Commanding the Pacific station, reported the disaster to the Navy Department. The gallantry and fortitude displayed by Kimberly, his officers and men, at the time of the disaster, called forth the warmest commendations of the Department. A little over two months after his near death experience, Gibbons was ordered detached and assigned to the U.S.S. Adams on May 28th. On July 16, 1890, he was ordered detached and assigned to temporary duty on the U.S.S. Independence. He received preparatory orders, for assignment to the U.S.S. Nipsic on July 31st but those orders were revoked and he was ordered detached from the U.S.S. Independence and assigned to Coast Survey on August 9th. He returned to the Naval Academy on August 10, 1891, where he was promoted to Lieutenant (Junior Grade) on December 6th. Gibbons was commissioned a Lieutenant (Junior Grade) on April 26, 1892 and assigned to Ordnance Duty at the Navy Yard, Washington, D.C. on September 9th. Twenty-two months later, he was assigned to the U.S.S. Chicago on July 20, 1894. The following year, he was detached and returned home, "to be ready for sea" on May 1, 1895, then assigned six weeks later to the U.S.S. Raleigh on June 13th. He was commissioned a Lieutenant on February 28, 1896 and assigned to the Assistant Secretary's Office on April 8, 1897. Gibbon was transferred to the U.S.S. Newark on May 21, 1898 and saw service in Cuban waters, during the Battle of Manzanillo and the bombardment of Morro Castle. In early 1899, he was assigned to the U.S.S. Massachusetts on February 18th, where he was to serve for almost eight months, before being transferred to the U.S.S. Brooklyn on October 8th. While with the U.S.S. Brooklyn, Gibbons was to see action in the Philippines in 1888-1889 and in China during the Boxer Rebellion of 1900. He was transferred to the U.S.S. Oregon on May 4, 1901, returned home and waited for orders on June 24th, before being assigned to the Branch Hydrographic Office in Buffalo, New York on August 5th. It was at this office that hydrographic surveys were conducted, which is the science of measurement and description of features which affect maritime navigation, marine construction, dredging, etc. He was in Buffalo at the same time as the Pan-American Expedition, the World's Fair that was held between May 1st and November 2nd. 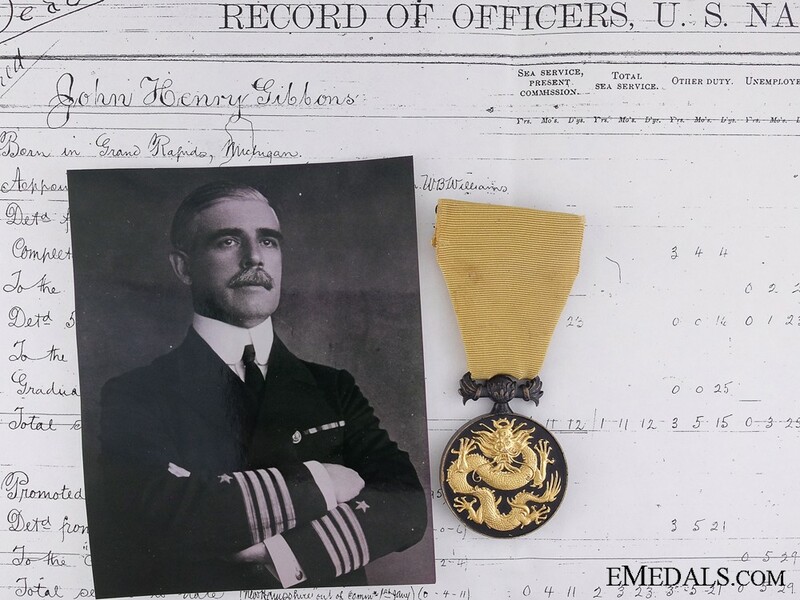 Gibbons was assigned to the Office of Naval Intelligence on November 11th and commissioned a Lieutenant Commander on February 9, 1902. He was named Commander of the U.S.S. Dolphin on June 11, 1903 and held the post with that ship until November 1905. The U.S.S. Dolphin was used by Presidents Roosevelt and Taft. Gibbons was Lieutenant Commander, as part of the Review of the North Atlantic Fleet of the United States Navy in 1905. He was ordered detached and returned home, waiting for orders on November 20, 1905. He was placed on duty as Lieutenant Commander, taking the position of Naval Attache in London, England, via passage from New York on December 16th. The following year, he was appointed Naval Attache to the Minister to Sweden and Norway on June 7, 1906, for the Coronation of King Haakon and Queen Maud at Nidaros Cathedral in Trondheim on June 22, 1906. Six months later, Gibbons was commissioned a Commander on Christmas Day, December 25, 1906. He was named Aide to Rear-Admiral Charles H. Stockton at the Conference of the International Prize Court in London, England on July 29, 1908. He was ordered detached on relief on June 13, 1909, in order to command the cruiser U.S.S. Charleston via St. Petersburg and the Siberian Route to Woosung, China on July 21st or to Chefoo (now Yangtai), China on July 31st. He was ordered detached when out of commission (U.S.S. Charleston) and returned home, waiting for orders on October 8, 1910, followed by his commissioning to Captain on October 20th. Three weeks later, he was placed on duty as a Member of the General Board in Washington, D.C. on November 10th. Gibbons was called into Washington on temporary duty frequently throughout his career. He was ordered detached from the General Board on May 15, 1911 and placed on duty for three years as Superintendent of the Naval Academy at Annapolis, Maryland from 1911 to 1914. He was ordered detached upon relief on February 7, 1914, to the U.S.S. Michigan for passage and departed on the 9th, in order to fall in with the U.S.S. Louisiana, where he was to take command of that vessel, reporting for duty on February 16th. Now, at the age of 55, he was named Commander of the U.S.S. Utah, taking passage from New York on April 23, 1914, for Mexico. By the end of June 1914, the battleship U.S.S. Utah steamed back to the New York Navy Yard, with the exploits of the bombardment and the taking of Vera Cruz, Mexico in April vividly ingrained in the minds of the American people. Gibbons had headed the landing party of marines and bluejackets. A few days after arriving in New York, Captain Gibbons thirty-five year career in the Navy ended, as he was transferred to the retired list on June 30th, retiring in early July. He had been "plucked" or forcibly retired by the board of five rear admirals known as the Selection Board of Retirement, thus becoming a "cause celebre" of the peacetime Navy. Captain Gibbons' fight to obtain reinstatement to active duty was aided by former President Theodore Roosevelt, the noted war correspondent Richard Harding Davis and others, resulting as Davis had predicted in the "plucking" of the "Plucking Board" itself. Assistant Secretary of the Navy Delano Roosevelt, named by Secretary Josephus Daniels to head a commission of inquiry and to recommend a new retirement plan to Congress, was instrumental in bringing this about. At the time he was "plucked", Gibbons boasted a brilliant record ashore and afloat. The official reason given by Rear Admiral Austin M. Knight, one of the board members, for the "plucking" of Captain Gibbons was that he had "added absolutely nothing to the efficiency of the Navy, but detracted from efficiency." The House Naval Committee heard other "unofficial" reasons which had to do with the naval officer's "English accent" and his presumed "airs" and social activities. This developed criticism had centered around whether he had returned from his tour of duty in London with an "English accent", with "English clothes" and with a retinue of English servants. However, the questions were never satisfactorily answered. Gibbon was quoted as saying: "I belong -- or did belong -- to a service wherein all orders must be obeyed without question. It does not make a man want to cheer when he finds himself suddenly cut off from his lifework. But that is part of the game." It was in vain that Theodore Roosevelt stated that Gibbons was "in every position a man of marked efficiency -- one of the most useful men in the Navy", and that "from the standpoint of the country, I regret very greatly that there is danger of our losing his services." In a letter to the New York Times, in which he embodied the aforementioned quotations from a letter written to him by Colonel Roosevelt, Richard Harding Davis, the noted war correspondent, who had come from Mexico on the U.S.S. Utah, vigorously defended Captain Gibbons' "practically unimpeachable record", and wrote "This year the 'Plucking Board' has eliminated officers of such value to the service that hereafter undoubtedly the 'Plucking Board' itself will be eliminated." Three years later, after the furor of the "Plucking" episode had died down, Captain Gibbons was recalled for service, as the United States had officially entered the First World War on April 6, 1917. He returned to active duty the following day, April 7th, reporting to the First Naval District, Navy Yard, Boston, Massachusetts, for duty as Commander of Naval Forces of the First Naval District effective April 9, 1917. He held that post for five months, before accepting temporary duty, reporting to the Director of Naval Intelligence, Bureau of Naval Intelligence, Navy Department in Washington, D.C. on September 17th. Two months after arriving in Washington, he was further directed, to be detached and on duty as a Naval Attache in Buenos Aires, Argentina, arriving to take the post on November 13th. He would remain in Argentina for the remainder of the war and then some, totaling twenty-nine months, his term ending on April 15, 1920. He was posted to the Office of Naval Intelligence, Navy Department in Washington, D,C. on May 22, 1920, returning home and relieved of all active duty on July 31st. 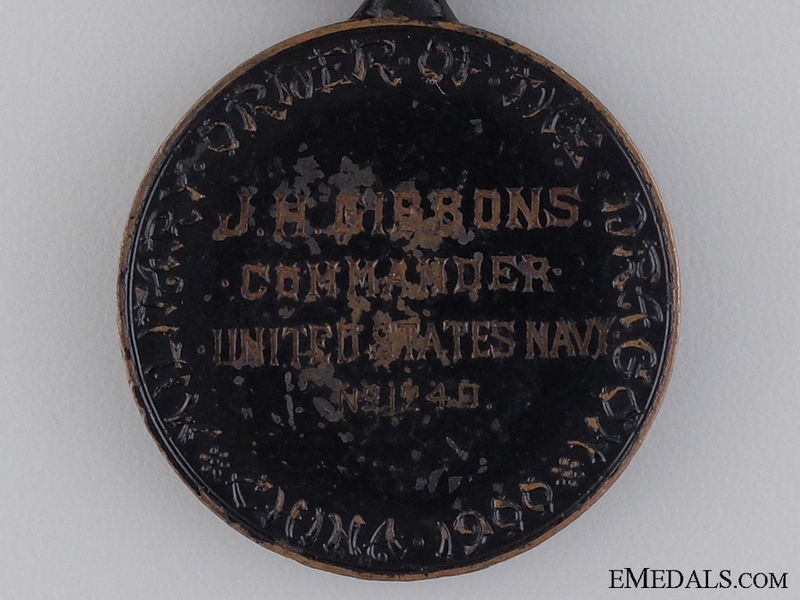 During his Naval career, Gibbons was entitled to the following campaign medals: the Spanish Campaign Medal (No. 335, while with the U.S.S. 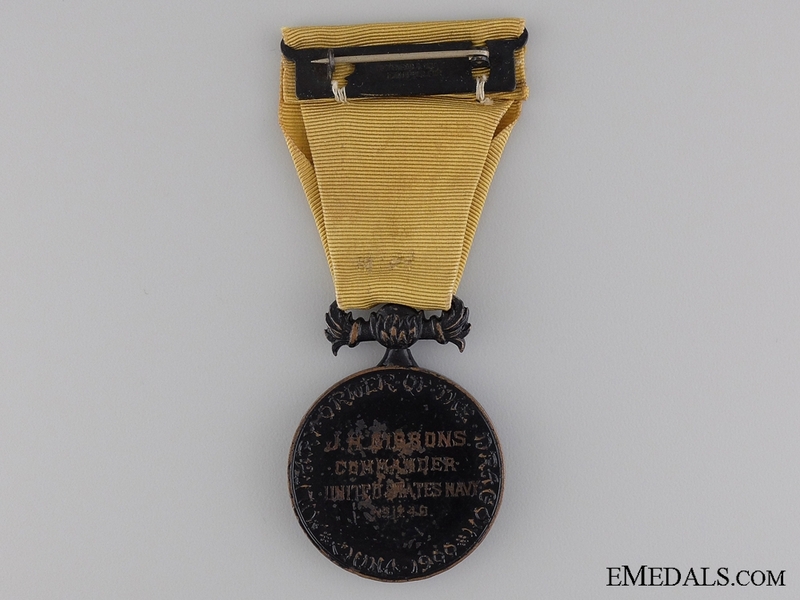 Newark, approved on May 13, 1908), the West Indies Naval Campaign Medal (Sampson Medal), the Philippine Campaign Medal (No. 90, while with the U.S.S. 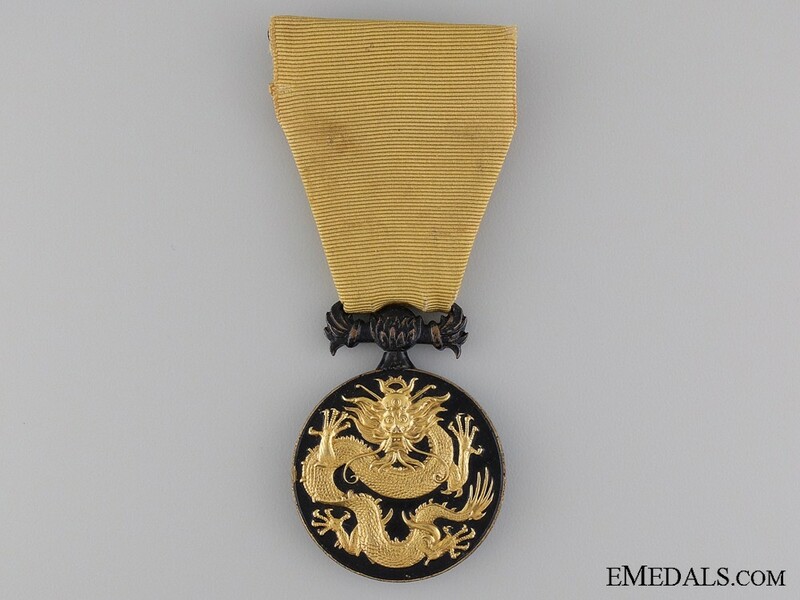 Brooklyn and General Alava, approved on May 13, 1908), the China Relief Expedition Medal (No. 100, while Commander of the U.S.S. Brooklyn), the Mexican Service Medal and the WWI Victory Medal. 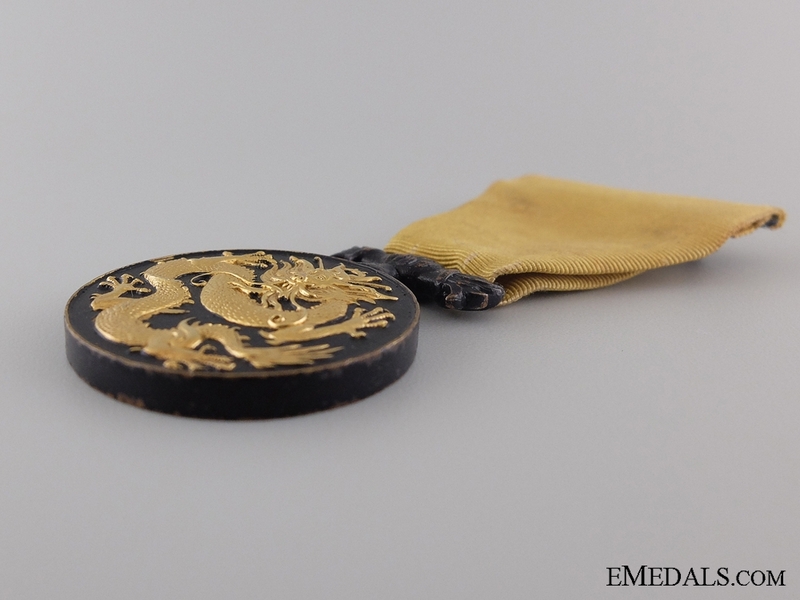 In addition, he was named to the Military Order of the Dragon, as evidenced by the Medal presented here. The Order was established by officers of the China Relief Expedition assembled in Peking, just prior to the reduction of the expeditionary force, creating an organized society designed to perpetuate the associations formed during the expedition. Meetings of officers were held October 1st. 2nd and 3rd, 1900, resulting in the adoption of a name for the society, a constitution, officers, etc. It was expected that this society would, in years to come, have a standing and historical interest similar to the well-known Aztec Society and the Military Order of the Loyal Legion. Its alliance with other kindred societies of other nations would undoubtedly tend to preserve acquaintance and friendships, which might otherwise be lost, and keep open the door for very desirable friendly exchanges, of a social and professional nature, with foreign officers. Interestingly enough, in a strange quirk, he was named to the Military Order of the Carabao, which was one of the most unique organizations associated with American military history. 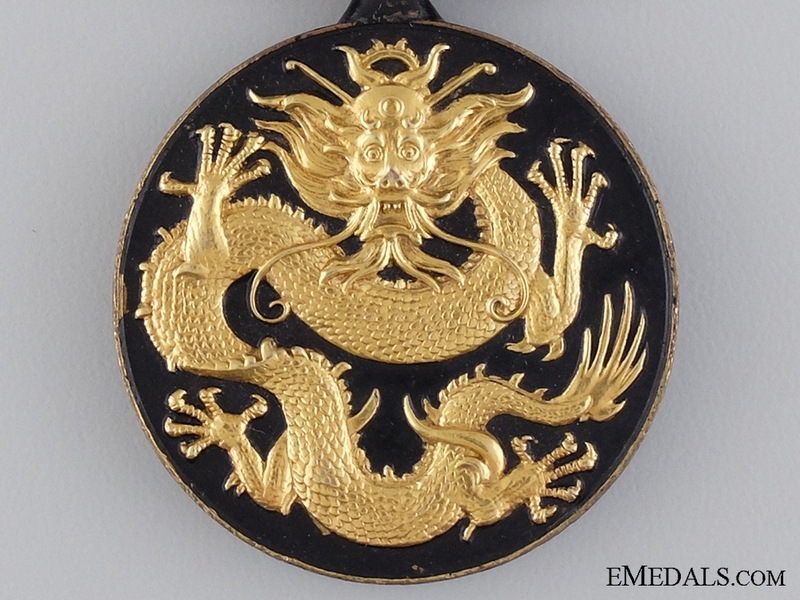 It was founded in 1900, to counter and satirize the very "pompous" perceived Order of the Dragon, which was founded by those who had defeated the short-lived Boxer uprising in China. Upon retirement, Captain Gibbons advised the Navy Department that his usual residence was 2029 Connecticut Avenue, N.W., Washington, D.C.. He was a married man, his wife being Maude Ely Gibbons. In later years, he maintained a winter home in Palm Beach, Florida and was active in local affairs. He was named a Member of the Board of Directors of the Everglades Club in 1930. Both he and his wife had entertained at dinner dances as late as 1938. Captain Gibbons died from pulmonary congestion with chronic degenerative myocarditis on December 22, 1944, at his winter home in Palm Beach, at the age of 85. Gibbons' Florida funeral service was held in his home on the 24th, the honorary pallbearers including Sumner Welles, former Under-Secretary of State, Rear Admiral Walter S. Anderson, Captain Cyrus R. Miller, George E. Kent, Arthur Graham Glasgow, Dr. Leland Eggleston Cofer, Dr. Leonard Sanford, Harry Pelham Ribbins and Dr. Hobart E. Warren. Summer Welles described his friend of thirty years this way: "I know of no man for whom naval officers had higher regard or who had a higher standing with the United States Navy." His body was forwarded to Washington, D.C., where a second funeral service was held at 2:00 PM at the National Cathedral on Thursday, December 28, 1944, followed by his interment in Arlington National Cemetery, in Arlington County, Virginia.